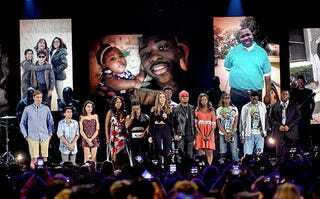 Teens whose loved ones died because of gun violence join actress Jessica Alba onstage at the Teen Choice Awards on July 31, 2016. Sunday night's Teen Choice Awards wasn't just laughs and jokes. The show took time to raise awareness about gun violence as well. Jessica Alba took the stage with teens whose lives were affected by gun violence, whether at the hands of police or armed criminals. Joining Alba onstage was Cameron, the son of Alton Sterling, the man killed at the hands of Baton Rouge, La., police; two of San Bernardino, Calif., shooting victim Bennetta Betbadal’s children; the siblings of Jason Josephat, who died during the shooting at Orlando, Fla.’s Pulse nightclub; and J.T. Lewis, who lost his brother during the Sandy Hook Elementary School shooting in Newtown, Conn.
“Tonight we stand together with these teens,” Alba said. “United in a call for peace and an end to this violence. Now, more than ever, we need to stop, feel and ask, ‘What’s going on?’”#StopTheViolence became a trending topic during her speech, and as the camera panned the crowd, there were tears and applause.